NitrogensSports.eu, one of the first Bitcoin sportsbooks that was established in 2012, seeks to provide players an opportunity to bet on a wide range of sports. With a comprehensive sportsbook that covers a huge selection of options, NitrogenSports is one of the leaders when it comes to Bitcoin sports betting. With a dedicated support staff, along with many other features, they are a top choice of many sports enthusiasts, when it comes to placing a wager with Bitcoin. Recently, they’ve also added a poker feature for players wanting that added extra feature. With a staff that prides themselves on listening to players requests, they set themselves apart from other sportsbooks, by providing a personal feel that many other books are missing in the industry. When we asked the support staff what their mission was, they responded to us by saying, “Nitrogen Sports is a community based bitcoin sportsbook. We maintain our strong reputation by offering outstanding customer service, competitive odds and best-in-class security.” As our review will indicate, they do that plus a lot more. When it comes to Bitcoin sports wagering, NitrogenSports is our top-rated book for a variety of reasons. First and foremost, the selections that they provide are near the top of all the sports books that we have reviewed. While they have all popular American sports covered, they also have a huge selection of international sports to boast about, as well. We were really impressed with their selection of little-known sports, coupled with some lower divisions of international soccer, that most other books were not able to provide a line for. When players use the NitrogenSports interface, they will be impressed by being able to select different lines with different prices. For example, when we selected an NBA basketball game, we were able to add up to four points to the total, 24 hours before the event was to take place. For soccer games, we were able to add or subtract a goal either way, to increase or decrease the price, for the bet that we truly wanted. Players may add up to 20 sports, to a parlay ticket, one of the highest total of parlay selections that can be added, in the sportsbook industry. What many players are excited to see, though, are truly competitive prices. While many books tend to have most of their selections overpriced, NitrogenSports always seeks to provide the most up-to-date and competitive prices, in the market. When comparing odds on the same selections between four different sportsbooks (Cloudbet, Nitrogen, Betcoin.ag, Jetwin) we found that Nitrogen had the best price on four out of the five selections we had randomly picked. NitrogenSports excels at being the top choice for players wanting both a great selection and a competitive price. Poker has recently been added to Nitrogen’s impressive sportsbook, and has shown signs of being a mainstay within their book. When we tested out features, we were impressed with how smooth the poker software ran, as well as not needing to download any software to play. At times, the poker room tended to be somewhat empty, but we attest this to the platform being new and players slowly finding out about it. Once its popularity grows, we predict that the poker room will gain a lot of users, and be a secure and top place to play. Nitrogen also provides daily free rolls and their weekly “Big Freerolls” (up to 10 to 20BTC pots), which no other Bitcoin poker site provides. They also have a poker rewards program that we will cover in the “Bonus Offers” section below, that is a nice perk for players who frequently play. When it comes to the features of banking, NitrogenSports once again is the leader in this category, as well. They offer instant deposits of Bitcoin as soon as it hits the block chain and produces a transaction hash. When it comes to withdrawals, though, they are the fastest in the Bitcoin wagering industry, with withdrawals only needing one confirmation of a player’s last deposit. Withdrawals are usually instant, unless a big win in the poker room has been achieved, in which a manual review usually takes no more than 5 to 10 minutes. When it comes to banking, NitrogenSports excels at being the industry’s best. Customer support and NitrogenSports is what they say they pride themselves on, on a day-to-day basis. After hearing that from many other sites, we can safely say that NitrogenSports exceeds in that category, where other sites could not. If players have an immediate question, they can post it to the player chat at the top of the page and a customer support member will reply to them, in a very short matter of time. The longest we waited for a question to be answered, in the chat, was around three minutes. Sometimes the support staff will tell you to send in a query through the support panel within the site. The longest we waited for them to address the issue there? Around the same three minutes that it took in the chat. When they do respond, they respond with class and always tend to be in favor of the player, when it comes to questionable discrepancies. Once again, NitrogenSports is a leader in the industry, in this category, too. Bonus offers come in a variety of different ways at NitrogenSports. While they don’t have a deposit bonus, the bonuses they provide tend to be better than a deposit bonus, anyway. Their first bonus is the amount of free rolls they have in their poker room, and the large pots they contribute to them. Weekly freerolls have been in the range of 2.5-20BTC, which is by far the largest freeroll amount that any site offers. The second bonus they provide, are the poker rewards, that are affiliated with each hand’s rake, within the cash game area. Once a certain amount of poker reward points have been earned, they can be redeemed for Bitcoin (with no wager requirements) or free plays within the sportsbook. A third bonus that they provide is a monthly parlay bonus. Loosely described, they take a portion of each parlay’s wager amount, and add it to a parlay jackpot. That jackpot is awarded out to players losing one selection of a parlay, with rankings determined by a few different factors. A final bonus, is random trivia within the chat. While it is mostly about sports, we also were a part of a random Seinfeld trivia question, the players desperately wanted. While that does seem comical itself, it just furthermore proves how NitrogenSports listens to its players, even about 90’s sitcoms. NitrogenSports offers its own proprietary software when it comes to their site. Their poker software is built around Randomizing Number Generation. They do not allow bots, or multiple accounts and if suspected abuse of these is in question, accounts will be banned and player funds will be returned. As sports betting can be checked by players, of course, there is no question of fairness when it comes to this aspect of NitrogenSports. NitrogenSports has been around since 2012, and continues to impress players since the time they became operational. With a comprehensive sportsbook that provides players both a great selection along with great prices, Nitrogen’s sportsbook is a top choice for most players. With poker being a rather new addition to NitrogenSports, the only problem that it currently has, is a lack of popularity. Most likely, sooner rather than later, that problem won’t even be an issue. When it comes to support, NitrogenSports excels in that category and goes above and beyond what a player would even expect. 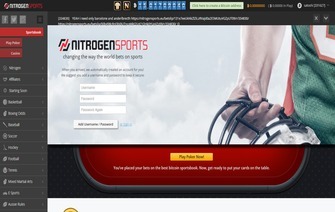 If a player is looking for bonuses, they should look no further than NitrogenSports. With a vast array of different styles of bonus offers, players will have a hard time finding a book that rewards them nearly as much as Nitrogen does. With as many great things as NitrogenSports offers, there is no question they are at the top of our “Most Recommended” of places to play. Bonus Just stay around and see how much can you get via weekly free-rolls and other cool promotions!